Developed by creative producers Artichoke and supported by the Mayor of London, Lumiere London is an outdoor light festival taking place across London’s West End and King’s Cross areas over four evenings from 14 to17 January 2016. Lumiere London will bring together an extraordinary array of installations from world-renowned artists to transform the capital into a winter playground. As part of this dazzling event, ‘Joining the Dots’ is a new commission, developed from the artists’ recent collaboration with perceptive psychologists and composed with young people from the local community. The artwork is inspired by Gunnar Johansson’s investigations into the perception of biological motion demonstrating that 13 moving points judiciously placed at the joints is the minimum number needed to define a moving human figure. In response to Johansson’s work, Cleary Connolly have applied these principles in workshops with the local community. In the projection, you can make out the forms of local children, vaulting over windows or treating the architectural details as a climbing frame, each depicted exclusively by thirteen moving dots. 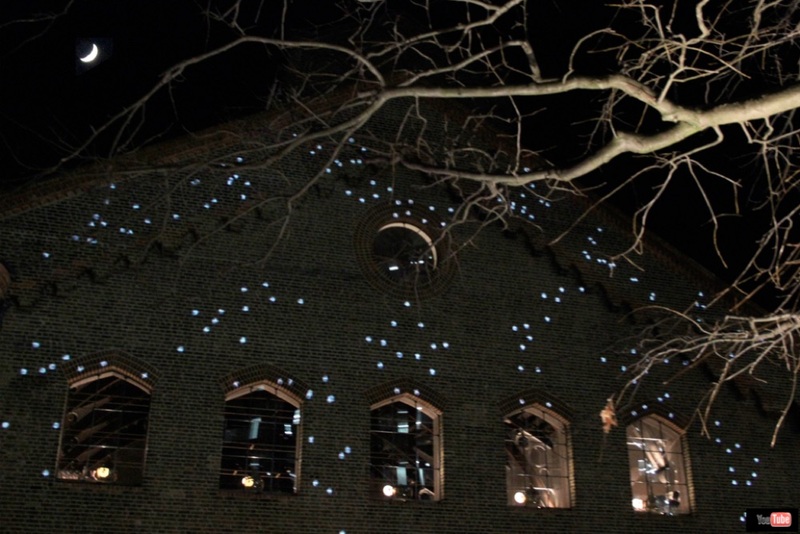 This light installation can be discovered at the former Grade II listed German Gymnasium in King's Cross. This is the world premiere of this artwork.